What are the causes of carotid artery disease? What are the risk factors for carotid artery disease? What is the treatment for carotid artery disease? What are the complications of carotid artery disease? What is the prognosis for carotid artery disease? The carotid arteries provide blood supply to the head. There are two common carotid arteries, located on each side of the neck, that divide into the internal and external carotid arteries. The external carotid artery provides blood supply to the scalp, face, and neck while the internal carotid artery supplies blood to the brain. Narrowing of the internal carotid artery may decrease blood supply to half of the brain that it supplies. This narrowing called atherosclerosis (atheroma = lump of plaque + sclerosis = hardening) occurs because of the accumulation of plaque on the inside of the artery wall. Plaque begins as a soft, waxy collection of cholesterol and triglycerides but over time begins to harden and calcify. Often it occurs where increased blood pressure and blood turbulence irritates the inner lining of the artery and this often occurs where the internal and external carotid arteries split (bifurcation). As the carotid artery begins to further narrow, the pressure within the artery continues to increase. This may cause the plaque to rupture, causing blood clots to form. 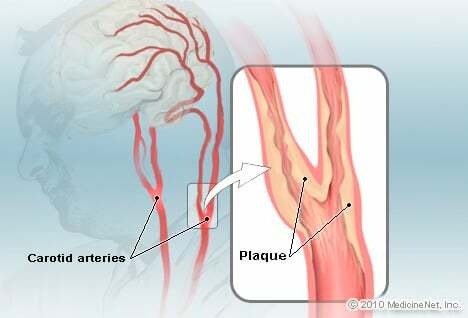 A large clot may completely block (occlude) the artery or smaller clots and bits of plaque may travel into smaller arteries within the brain and cause disruption of blood supply to parts of brain tissue. It is only when a stroke or transient ischemic attack occurs, or a bruit (blowing or whistling sound) is found on physical examination by your doctor, that the diagnosis of carotid artery disease is usually made. Otherwise, the narrowing carotid artery does not cause symptoms. Carotid artery disease occurs because of damage to the inner lining of the artery. This is a gradual process that is associated with smoking, high blood pressure, high cholesterol levels, and poorly controlled diabetes. These all may cause minor damage to the inner walls of an artery, and during the healing process, inflammation may occur and plaque may begin to form. Over time, the area of plaque may grow and narrow the lumen of the artery, the channel where blood flows. It becomes a vicious circle as the narrower lumen increases pressure within the artery and blood turbulence, which leads to more arterial wall damage and more plaque formation. 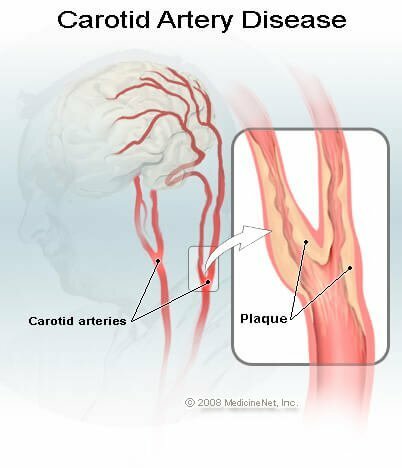 Decreased blood supply to the brain can be caused by carotid artery disease, and result in a transient ischemic attack (TIA) or mini-stroke. One of the symptoms of TIA is difficulty with speech. Difficulty with speech can be the result of problems with the brain or nerves that control the facial muscles, larynx, and vocal cords necessary for speech. Likewise, muscular diseases and conditions that affect the jaws, teeth, and mouth can impair speech. The risk of narrowing carotid arteries is the same as the risk for those diseases associated with narrowing of arteries anywhere else in the body, including heart attack, stroke, and peripheral artery disease. Those at risk include individuals who smoke and those with high blood pressure (hypertension), high cholesterol, poorly controlled diabetes, family history of atherosclerosis, and advanced age. large waistline, a sign of abdominal obesity. Carotid artery disease in itself has no symptoms. It is only when blood flow to parts of the brain is decreased that the diagnosis is made. Decreased blood supply to the brain may result in either a TIA (transient ischemic attack) or stroke (CVA, or cerebrovascular accident). A transient ischemic attack is a stroke-like group of symptoms that resolves on its own and should be considered a warning sign that a stroke is imminent. While the symptoms tend to resolve on their own in a few minutes, they may last up to 24 hours. Signs and symptoms of a stroke are similar to a TIA but the effects are permanent without successful treatment. Since there is no way of knowing whether the symptoms will resolve, any of these symptoms should be considered a medical emergency and the patient or family should call 911 to activate the emergency medical services. Individuals who are having stroke symptoms may be candidates for treatment with clot busting drugs or thrombolytics, but the treatment must be initiated within 3 to 4 hours from the first onset of these symptoms. When a person has a TIA or stroke a doctor may take a history to evaluate the source of the bleed. The carotid arteries may be evaluated as a potential cause of the TIA or stroke. This is an important part of the diagnosis and treatment of a transient ischemic attack, since the TIA is a warning sign a stroke may be imminent. Finding a treatable cause and minimizing risk of a future stroke is an important component of patient treatment. Ultrasound is the most common screening test to determine whether carotid artery stenosis (narrowing) is present. Sound waves are used to understand the anatomy of the artery to see whether narrowing is present. Adding Doppler technology, the amount of blood flow and its velocity can be measured. Should ultrasound detect carotid artery disease, the next step is to better show the anatomy of the arteries that supply the brain. Angiography is a procedure used to identify any structural abnormalities within the large and small arteries that supply blood to the brain. Historically, angiography was performed with a catheter threaded into the artery and having dye injected to outline the blood vessels. In some patients, the artery anatomy can be seen using CT (computerized tomography) or MR (magnetic resonance) angiograms. In both CT ad MR angiographies, dye is injected into an arm vein, instead of an artery. If the carotid artery is less than 50% narrowed, medical treatment is recommended. This includes stepwise antiplatelet therapy. Platelets are blood cells that help clot blood and in patients who have had symptomatic carotid artery disease, meaning that they have experienced a TIA, and decreasing platelet stickiness may be helpful in minimizing future stroke events. The first line medication is to treat the disease is aspirin. If the patient was already taking an aspirin and still experienced a TIA, the next line medication may be dipyridamole/aspirin combination (Aggrenox) or clopidogrel (Plavix). Surgery is a potential option for patients with more significant carotid artery disease. Two options exist, 1) carotid endarterectomy, and 2) carotid angioplasty with stenting. In endarterectomy, the surgeon cuts into the artery, removes the plaque buildup and repairs the artery incision. In angioplasty and stenting, a vascular surgeon or interventional radiologist inserts a catheter into the artery and inflates a balloon squashing the plaque into the artery wall. A stent or cage is then placed at the site to keep the artery open and prevent re-narrowing. Surgery is recommended for symptomatic patients who have carotid artery narrowing greater than 70%. Surgery may or may not be of benefit for symptomatic patients whose narrowing is between 50% and 69%. Some patients decide to be screened by ultrasound for carotid artery disease even though they have no symptoms. Surgery is a controversial treatment option for asymptomatic patients who have narrowing greater than 60%. who have completely blocked arteries because the body may have developed collateral circulation that bypasses the blockage. who have already suffered an irreversible stroke because there is no benefit to restoring blood supply to an area of the brain that has already died. Brain cells cannot be replaced and do not regenerate. Loss of blood supply to the brain will quickly cause brain cells to die. The eventual result of carotid artery disease is transient ischemic attack and stroke. The narrower the artery, the more likely a stroke will occur. However, it is impossible to say with certainty which individual will or will not develop stroke symptoms. Prevention is the cornerstone for treating carotid artery disease. Like any other blood vessel in the body, carotid arteries are at risk for narrowing in individuals who smoke, have high blood pressure, high cholesterol, have diabetes or have a history of heart attack or stroke. Living a healthy life-style includes eating a well-balanced diet, maintaining an appropriate weight for your height, and exercising routinely. Smoking increases the risk for carotid artery disease and stopping smoking is beneficial, even at an older age. Lifelong control of high blood pressure, cholesterol, and blood sugars will decrease the risk of developing carotid artery disease. Many individuals have some narrowing of their carotid arteries and have no symptoms. There are benefits and risks for both medical and surgical management of carotid artery disease. The decision as to which treatment is offered depends upon the age of the patient, their neurologic status, their other underlying medical conditions, and the degree of carotid artery narrowing. The purpose of treatment is to reduce the risk of stroke. In patients whose treatment recommendation includes antiplatelet medications associated with blood pressure, cholesterol, and diabetes control, the risk of stroke after 2 years may be as low as 11%. For patients who qualify for surgery, their risk can fall to 2%-5%, but there are associated surgery risks including stroke, cranial nerve paralysis with hoarseness and difficulty swallowing, and restenosis or renarrowing of the artery. The doctor needs to discuss the benefits and risks of treatment to tailor the recommendations to the individual patient's needs. Brott TG, et al. Stenting versus endarterectomy for treatment of carotid-artery stenosis. N Engl J Med. Jul 1 2010;363(1). Marx J, et al. Rosen's Emergency Medicine Concepts and Clinical Practice. 8th edition. Saunders. 2013. Learn how to lower cholesterol, high cholesterol foods, and low cholesterol diet. 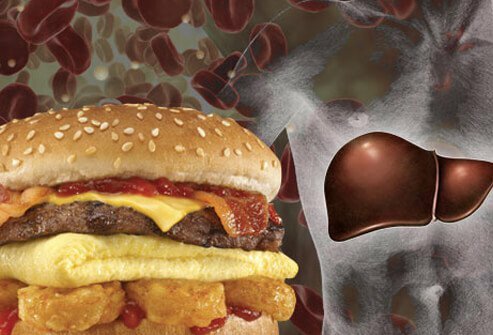 What is the difference between good cholesterol and bad? What are normal cholesterol levels? What were your symptoms of carotid artery disease? What was the cause of your carotid artery disease? Have you been tested for carotid artery disease, if so, what test did you have? Please share your experience. If you have had surgery for carotid artery disease, please share your experience. What treatments have been effective in treating carotid artery disease? The CT coronary angiogram procedure is a noninvasive test of the heart. The procedure uses an intravenous dye and CT scanning to image the coronary arteries. CT coronary angiogram is a major tool in the diagnosis of coronary artery disease. The muscle that pumps blood received from veins into arteries throughout the body. See a picture of the Heart and learn more about the health topic.